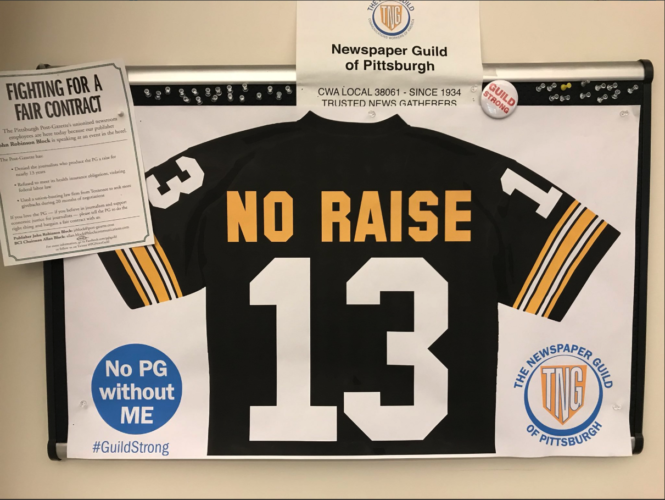 Members of the Newspaper Guild of Pittsburgh hung this poster on a bulletin board in the newsroom, representing the 13 years they have gone without a raise. From Twitter. 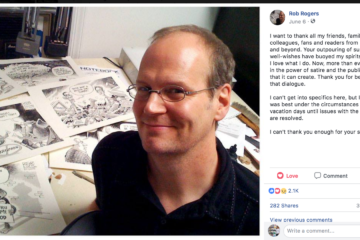 Did Post-Gazette Publisher John Robinson Block completely lose control and go “berserk” as the newspaper guild says — or was he simply blowing off frustration over the news industry’s dire situation? Either way it seems something unusual happened inside the newspaper’s North Shore offices Saturday night — and that the ongoing contract negotiations among the Post-Gazette and its newsroom employees has led to hot emotions on all sides. The guild’s contract expired on March 31, 2017. “The frustration over financial and other challenges in the newspaper industry led to an unfortunate exchange with employees of which I have been made aware,” Allan Block, the chairman of Block Communications Inc., told me in a emailed statement. The guild’s unit chairman Jonathan Silver posted a message to Twitter in December about the union’s bulletin boards. From the guild’s perspective, John Block went “berserk.” The union’s unit chairman Jonathan Silver wrote as much to guild members in an email Sunday, describing the newsroom incident, saying the publisher started screaming loudly, threatened to fire managers and ranted about the hundreds of millions of dollars his family has lost on the newspaper. Block apparently had been set off by a sign that the guild hung in the newsroom in December on one of its three bulletin boards. The sign covers one entire board pointed in the direction of Block’s office and says, “Shame on the Blocks!” in black and red letters. “Block was screaming at the top of his lungs, raving like a lunatic and repeatedly and loudly slapping the Guild bulletin board with his hand,” Silver wrote in the email to union members. Block had arrived with his daughter and wanted to take her photograph with the sign. He ranted that the sign is now part of his family’s legacy, and threatened to shut down the newspaper if the guild does not take down the sign by Tuesday, according to the email. Block also railed against former editors David Shribman, who stepped down at the end of last year, and John Craig, who ran the newspaper from 1977 to 2003, and who died in 2010. Silver declined to comment for this column. The situation turned so tense on Saturday night that several guild members called Silver and Mike Fuoco, president of the Newspaper Guild of Pittsburgh, around 10 p.m., and they came into the newsroom 45 minutes later. A top editor and the company’s human resources head also came in, according to Silver’s email. Ultimately, the management employees calmed the situation, told Block he needed to leave and he left. Exchanges between the union and ownership have become more confrontational in recent months as the guild has started taking a higher profile stance. In December, for example, newsroom employees stood outside the Omni William Penn Hotel handing out leaflets as John Block was preparing to speak to the Rotary Club inside. That same month, the union hung up three signs in the newsroom, including the one directed at the family. Another sign says, “Pay the premium!,” referring to the union’s demand for the company to continue making employee health care payments during negotiations. A third looks like a black-and-gold football jersey with the words “no raise” and the number 13, for the years that employees have gone without a pay increase. “These posters were conceived and executed by @PGNewsGuild members who are frustrated and angered by how our employer is treating us as we are in the 22nd month of contract negotiations … ,” Silver wrote on Twitter in December. The union has no plans to take down the signs, Silver wrote in his email to members, until the company pays for employee health care and backs off its legal battle in the contract negotiations. Fuoco spoke with NEXTpittsburgh this morning to provide a comment on the incident: The guild sent a second email to its members on Monday night, telling them that if they fear for their safety, they should call in Tuesday and report for work from home. Fuoco said at least one employee already has done this. The guild has asked newspaper management to search Block and his office, and to deactivate his access card so he cannot enter the newsroom. Another sign on a Guild bulletin board at the P-G. He added that the union views this incident as an issue of concern for the safety of Block and his family — and not as a negotiating tactic. He added that the company has photographs and video of the incident from Saturday night. Andrew Conte, director of the Center for Media Innovation at Point Park University, writes the On Media column at NEXTpittsburgh with support from The Heinz Endowments. You may find all of his columns here, and you may reach him at [email protected].